I was standing waiting for a 344 bus on the corner Marshalsea Road and Southwark Bridge Road on the morning of Saturday, 20th June, 2009 when the rubbish collectors arrived to take away the waste that is supposed to be recycled. There was a gentleman who had just spent approx 5 mins sorting out what goes in what recycle bin to walk away looking a little confused. 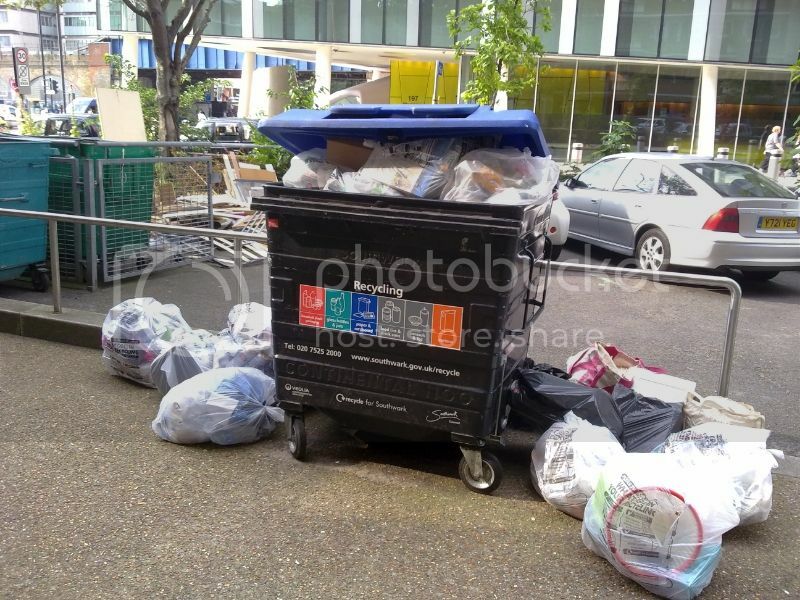 He saw, as did I tha all the contents of the 4 different recycling bins that are situated opposite the junction of Southwark Bridge Road and Great Guildford Street all go into 1 rubbish truck, in one go, no seperation, and clearly no recycling going on through Southwark Council. I myself have spent a long time with one big clean up project to feel good that I'm doing my bit for the environment. I see many people from the area, including my family members who spend the time to individually recycle waste into the respective bins, but now that I've seen this. Errrr... what for?!? I have seen a dumper truck which takes in the different bins seperately in the past, but really, there is no excuse for this. I also made an appoinment to have an old computer monitor disposed in the 'correct manner' as it contained a lot of lead within its components. And same again, Southwark Council's rubbish team just threw it all into the back of similar kind of truck. Upon questioning the rubbish man, he said "nah, it all goes to the same place". So, it would seem that Southwark are just maintaining their government quota on the surface at least to make it look as though they're doing their bit. But in reality, they clearly aren't. And how much is my council tax again?!? I wonder how many other borough's around town are doing the same thing. But more to the point, what the hell are the people at Southwark Council below playing at? i see one of our cleaners just put the Recycling bag's (that was set a side for the Recycling van) and dump them in the blocks bin i was gob smacked....... whats the point of wasting our time ??? mind you it is southwark council's name behind this all ways cutting corners . The truck that collects our kerbside recycling has a sort of sorter on the outside which tips into separate containers. That said, I notice that the "Recycling Centre" nearby now has all-in-one bins rather than separate ones for glass, paper and tins. I assume these are taken away and sorted. I'd be interested in the difference in cost leading to this decision. 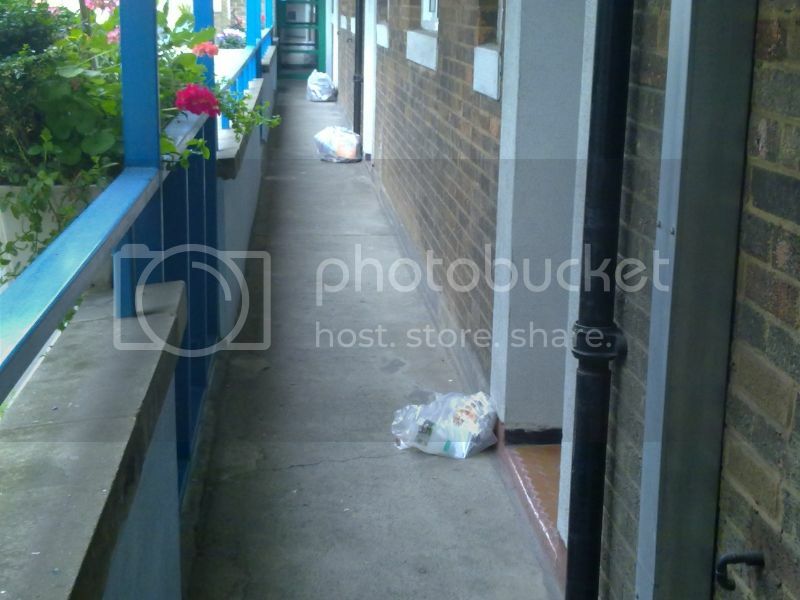 We used to have separate bins in our flats. A couple of weeks ago, we got a leaflet telling us that this would be discountinued and that in future there would be no need to sort recyclables. The glass, plastic, etc bins would be replaced by a single (blue topped) bin for all recyclables and another bin for non-recyclables. Apparently, the council takes all the recyclables to a site somewhere and sorts them into plastic, glass, etc, there. I know that this is what some councils have always done. The leaflet said that it would be more efficient for Sthk to do it this way in future. I still keep my recyclables separate, but it's a lot easier to have one bag for everything. The husband of a former colleague of mine worked for a guy who had his own recycling business and, after a couple of years watching and learning, he set up his own business. Pardon my French, but he is now piddling pound notes! Or, to put it in modern day parlance....He's minted! What I can't understand is how and why, for the same reason as some of the postings above. When I lived in Hereford a few years ago I got it straight from the horse's mouth, (i.e. a refuse collector/dustman,) that most of the recycling goes in to landfill as they where overwhelmed by the public's response to the recycling campaign and simply couldn't cope. I have also been told that the recycling bags that do go to the r/c depot are scanned and if there is so much as a scrap of food residue in, for example, a tin can, then the bag is rejected and sent to landfill. If so little of the recyclable material is actually recycled then not only are we wasting our time, but a lot of potential money making AND more importantly, environment saving waste, is .....Going to waste. sometimes i do wonder whether we are just doing it for the peace of mind, doing our bit. you have no control over what happens in the next steps. and stories about waste being shipped all the way around the world to china to be 'recycled' does not exactly put me at ease. when they introduced the recycling programme in germany many years ago (10+yrs), they had such an overwhelming response, that most of it went on the landfill anyway, they couldn't cope with the sheer volume! i believe it is all sorted now. same thing in denmark, where they have abandoned the household recycling all together after they couldn't cope. you now have to take your stuff to the recycling centre in a car(!). household bins are only emptied every two weeks, so you are more or less forced to do this. i find the new containers great and it makes it easier, let's hope that southwark is getting the other end of the chain sorted. Actually, if you consider the logistics and added fuel costs of having a truck for each material instead of each area.... You'll realise it's not that easy. This is obviously a compromise; the waste sent for recycling is sorted again on a conveyor line anyway, if the same bins were used for all recyclables, there'd be no way of seperating stuff at this point. As it is, on the sorting line; grouped waste comes along in the order and bulk in which it was collected. Although different types come from the same truck, this at least means there is some seperation of the entirity. People don't do these things to take the piss. If the public campaigned rather than complained, other solutions might be arrived at. To be honest, if you consume the waste, you are responsible; but the people who produce and promote what is consumed have the real responsibility to work together and decide on the answer. A letter was put through our letterboxes last weekend, saying our recycling collection would move to Monday as now the team collecting the recycling in the communal bins would also collect our clear bags, starting this Monday (yesterday). Did not quite go to plan then?